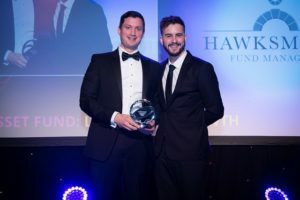 Hawksmoor Fund Managers picked up another award at the 14th Professional Adviser Awards. In a tough shortlist of finalists, the Vanbrugh Fund beat Fidelity, Premier and Quilter to the title at a black tie event in London. Ben Conway accepted the trophy on behalf of the Fund Managers team from comedian and impressionist Luke Kempner.